The enthalpy of vaporization (or heat of vaporization) for liquid nitrogen is a constant at any given pressure. 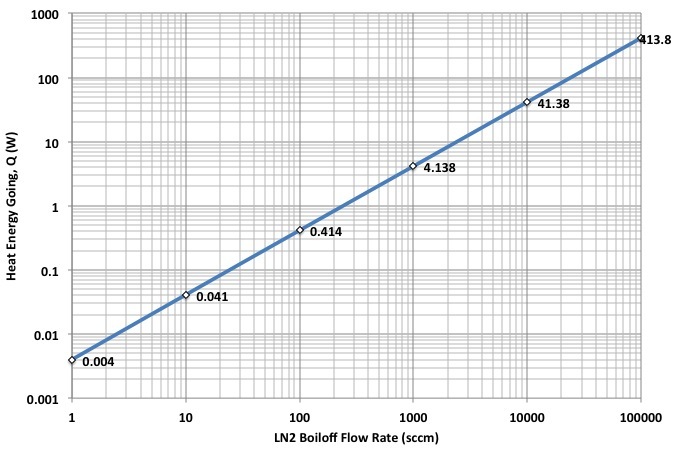 We can therefore measure the boiloff flow rate and directly calculate the heat going (Q). That is it: the flow rate is directly proportional to the heat energy. For example, a boiloff flowrate of 1,000 sccm (or one liter per minute) equates to 4,138 W (see Table and Chart below). Knowing the boundary temperatures and geometry of the insulation test specimen, we can then calculate thermal properties such as heat flux (q) and effective thermal conductivity (Ke). 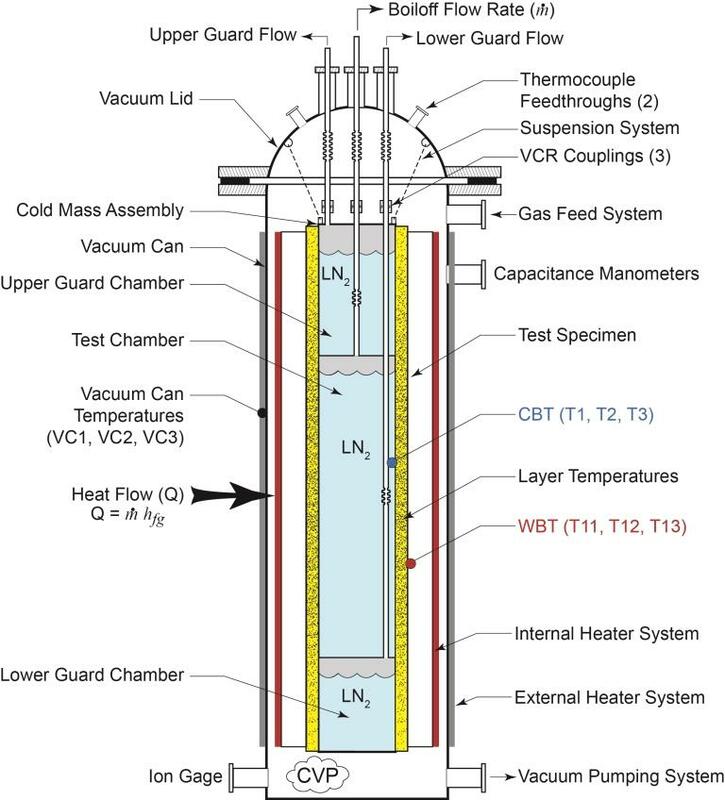 The heat flux depends on the effective heat transfer area which is a small test specimen of 146-mm diameter in this example. 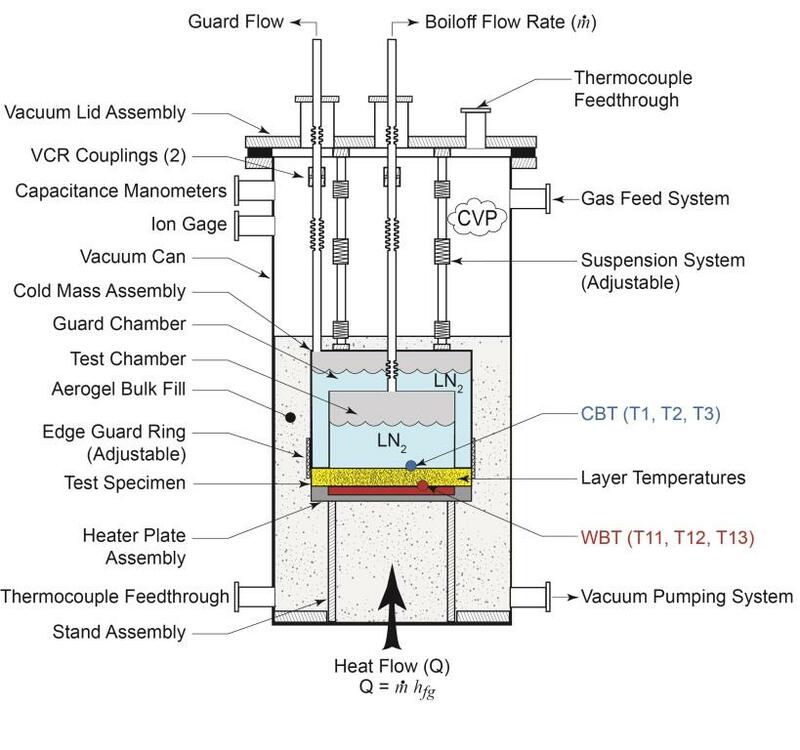 The basic apparatuses for both flat-plate (round disk) and cylindrical type instruments for cryogenic boiloff calorimetry testing of thermal insulation systems are shown in the Figures below. For more information, see ASTM C1774, Standard Guide for Thermal Performance Testing of Cryogenic Insulation Systems. See also the recent presentations from the 2015 Cryogenic Engineering Conference in Tucson, Arizona: Cylindrical Cryostats and Flat Plate Cryostats.